Published on Jun 20, 2013 | Get Wild, Go Native! Native gardening is good for our air, our water and us. Join our “Go Native” group to learn about all of the ways you can “Get Wild” in your life! 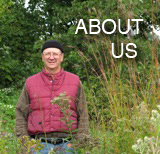 Sign up at nature.org/GoNative to receive monthly “Plant This, Not That” gardening tips and updates on new featured gardens from across the Midwest.